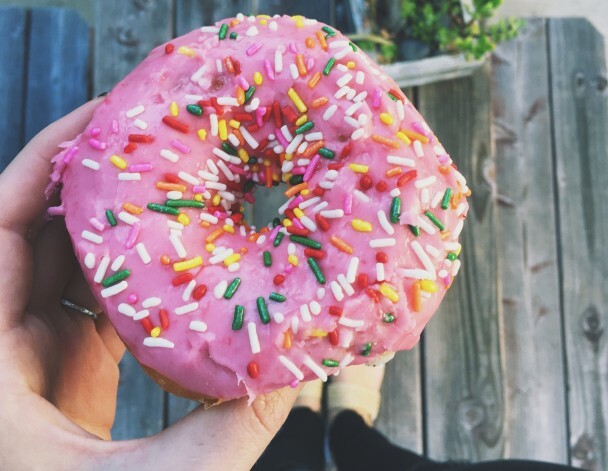 Who doesn’t love a donut? Yes, they are the worst things in the world for you bla, bla, bla​ –​ I’ll take two​. After a successful week of launching some rad projects​,​ ​we wanted to celebrate with a few donuts ​for the office​ (which has become a mini tradition here). Today ​I​ was going to get the donuts. Realizing I had never actually been in a donut shop​, I was intrigued. I am familiar with the classic donut signs and outdated building​s, but what was behind those doors was a mystery. I walked into Donut Star in Mission Hills to be greeted by friendly people and a sweet aroma that made me want to say forget ​needing to fit into my wedding dress – I​’​m eating donuts the rest of my life​.​ The colors, the shapes, the textures, the sizes, I couldn’t contain my excitement! It was like I was making art simply by selecting the donuts I wanted to put into my to-go box (all you artists, pipe down). So​,​ I took my proud little box to the checkout and here’s where ​it gets crazy – the total was $7!!! Did somebody say VALUE?! My box of happiness to share with my coworkers was only $7​! ?​ How did I not know this? Why doesn’t this happen every day? Not only did this experience totally make my morning, but it made eating my donuts that much more enjoyable. And yes that was plural. So forget chocolate, when life is like a box of donuts, you always know what your going to get. aaahh, Donut Star is the best!! why am i working remote today.. can you cram a donut through the webcam of google hangout?